In the first week of Silly Fish Learning’s first birthday month, we’re looking at a classic party game. 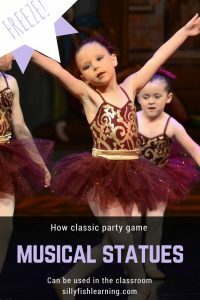 Musical Statues is a fan favorite at parties, but is also a useful classroom tool to burn energy and help children focus. Have the children find a dance space in the room. When the music plays, the children must dance. When the music stops, they must freeze like a statue. If you see a child moving when there is no music playing, they are eliminated. Keep going until only one child remains. For an extra challenge, pick a theme for the statues (e.g. animals) or ask the children to dance a certain way (e.g. ballet). If you’re a drama teacher, Musical Marks is a great directing tool developed from this game.